For over 15 years the Tahr Anorak has been recognised around the world as the very height of excellence in wet weather jackets. We’ve taken all those features that made the Tahr a standout winner and added handwarmer pockets, a scalloped tail and a new storm closure, complete with waterproof zips. The Tahr XP is in a class of its own. Just when you thought it couldn’t get any better - it did! 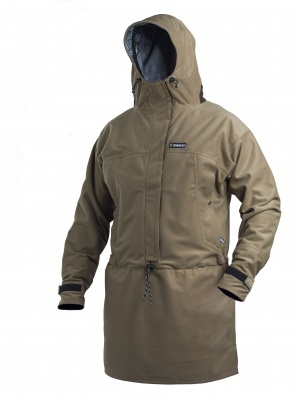 The Tahr XP lifts the bar and sets a totally new level in weather protection for the serious hunter. Well, about the best outerlayer on the market. Tough, comfortable, practical and highly water resistant. The Tahr Anorak is made from a three-layer AEGIS fabric . This fabric is a tri-laminate construction (woven polyester face-fabric, flannel liner, AEGIS membrane between).Its tough and soft, quiet and unbelievably comfortable to wear. Being a Aegis fabric, it is of course totally windproof, highly water resistant and extremely breathable, making it ideal for activities like stalking, canoeing, hunting and walking. The Tahr comes with a modified, two-tier, high peripheral-vision hood. The inner conforms to the contours of your face, while the outer protrudes into an adjustable peak, stiffened with a durable liner and concealed wire-lined frame. Aegis stretch cuffs designed especially to keep icy water at bay. The upper body design gives 25% extra freedom of movement, extra climbing movement completes this most durable piece of outdoor clothing. We hold stock of these, but if we don't have your size, these are made to order and can be 2-3 weeks to deliver .No returns! Purchase through PayPal by using the "Add To Cart" button above or use the form below to order the SWAZI Tahr XP . Feel free to contact us if you have any questions about the SWAZI Tahr XP .